I Don’t Want Your Balance - What Doing Mommy? I posted this status 2 years ago on my personal FB page. I reposted it a year after that. And today I am here on my blog site posting it again. Why? Well, for starters I recently received an “all employee bulletin” in my inbox urging staff to attend yet another webinar on Achieving Work Life Balance. (sidebar: there tends to be a spike in these types of requests after the annual survey reveals yet again that a significant portion of employees are suffering from burnout. And even though the numbers continue to decline or stay the same they continue to try to sell us on these Work-Life Balance scams.) 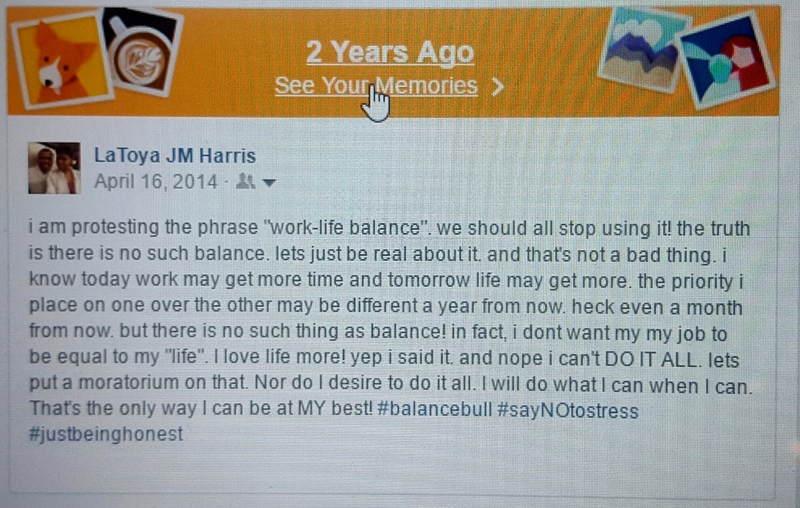 I also feel compelled to repost because I feel the same today as I did 2yrs ago when I expressed these sentiments. THERE IS NO SUCH THING AS WORK LIFE BALANCE!!! I’m not sure who came up with the concept. I didn’t bother looking it up for fear I would send some spam their way. Call me Petty J Blige. J I do know, that according to the US Department of Labor, between 47%-60% of workers report having work-life conflict. That makes me sad. All these good people struggling with a concept that is completely unattainable. Work-Life Balance is as unrealistic as the pot of gold at the end of a rainbow…or Donald Trump making American great again. You will never balance the two in my opinion. And for me there is absolutely ZERO desire to have them balanced. Surely I can’t be the only one. I value life (i.e. family, friends, vacations, etc.) much more than work on any day. More often than not, I’m giving more to the family on Monday and more to the job on Wednesday. It’s a bit of an ebb and flow. And there are many days I have to make difficult decisions that result in me sacrificing more of my personal life than work. I don’t like those days. I try to make those instances few and far between. I don’t want to miss Field Day or not being able to volunteer as Mystery Reader at class. I want to take that girlfriends trip to Europe. Sometimes I don’t have a choice. But in those moments I don’t kid myself that there is some sort of balance being achieved. I’ve eliminated this imaginary unrealistic goal from my life, which in turn eliminated the stress of trying to make it to a destination I would never reach. This important shift in my perspective occurred shortly after I had my oldest child. Priorities were reshuffled. I realized that while my job is important to me I was no longer interested in putting career above anything else or trying to “balance” it against other things (or people) I loved and enjoyed. For let’s be honest, while we may be conflicted between work and life MOST of the corporations we work for are in no way conflicted on what matters most to them…you and your family or their bottom line. This is why so many Americans continue to fight for a living wage, maternity and paternity care and affordable health insurance. If you quit your job (don’t do that by the way) you would be replaced by next quarter. Let’s keep it 100! I do want to be clear that I don’t judge those of you who feel differently. If you choose work, live in that truth and be proud of it. Or maybe you want to continue to seek balance in some way. DO YOU. I hope and pray you get there. I am simply no longer suiting up for that particular race. I can not do it all. I won’t attempt to do it all. And when it comes down to work vs life…I choose life! I want to FULLY LIVE LIFE…not just balance it. Am I alone? You can be honest? I’d love to hear from you. Leave me a comment with your thoughts. Til next time. Thanks for stopping by Adrienne! Glad to see I’m not alone!